Assalamu alaikum dear friends. Hope all are fine. Today i am gonna to showing how to set Custom Robot txt and Custom robots header tags on blogger. This article help the beginner bloggers. Because Custom Robots header tags setting is most important for every blogger. 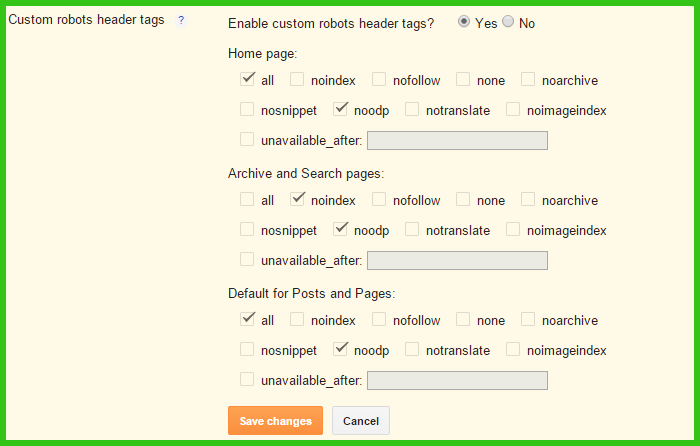 Custom Robots header tags play and important role on Google Search engine and this setting helps you on better SEO too. Custom Robot.txt is an another important setting of blogger. If you want to index your content on google, then custom robot.txt is must be set. Custom Robot TXT help you for indexing your url on google. By setting this option you should get better result from Search Engines. Now comes to the main point. At first i am show you the custom robot txt. Note: "http://your-blog.blogspot.com" just replace it with your blog url. This is the most important part of blogger. Every blogger must be set this setup. Now i just added a screenshots of Custom robots header tags. That's it. Now click "Save changes". Hope guys you understand about how to setup custom robot.txt and custom robots header tags for blogger. This setup help you lot to get better search results. Does this affect the robot.txt already written into the template? Will it cause a conflict? By the way, great informative blog! NO problem. One will be ignore. thanks for share.it was so helpful article for me.. Thanks bro for your responds. Thank's MS Design, Nice Tips..i like.